Do you need more living space while enjoying you garden the whole year! Than an orangery might be just what you need! Discover all to know about the design, materials and factors that affect the orangery prices in this guide. Orangeries. The word itself even sounds sophisticated. There’s something particularly special when deciding to have an orangery installed; it’s a talking point and it certainly adds value to your current property. These wonderful features make a great addition to your home, creating a warm, light and sun-filled room that can be used all year round, regardless of the conditions outside. While they are more pricey than your average lean-to, orangeries are worth the cost and might not be as expensive as you first imagined. The team at RJ Lifts have created this comprehensive guide to help you understand what an orangery is, the average orangery cost and the different options available to help you decide on the right orangery for your property. An orangery is a room (or extension) with a brick base (and often brick walls), flat perimeter roof & central roof lantern with both windows & doors. An Orangery is a form of room, often labeled as a “home extension”, that can be utilised in the same way a conservatory can. Orangeries offer home owners the chance to expand their living space in style, whilst offering unique styling & design options that are different from your typical conservatory. The brick and mortar development of an orangery means that your new extension is better suited to your home’s architectural appearance and design. It also provides a suitable extension of your existing room – whether it be your kitchen, dining, or living room (even a bedroom if you like) – or can easily act as an entirely new room, with walls secluding it from the rest of your home. Orangeries often provide a more contemporary living space compared with a conservatory, due to the method of construction, although bare in mind that its also possible to include plenty of glass for a greater source of light, should you choose to. Orangeries also feature much flatter roofs and the brick foundations allow such a shape to be heavier or to carry more weight than a conservatory. Light comes from a raised centre lantern, external windows, or both depending on your decision. The brick also retains much more heat and acts better from an insulation stand point, in both the walls and roof, unlike a conservatory, keeping your heating bills to a minimum. On the flipside, such construction methods mean that orangeries are more expensive than a conservatory. Depending on the job, you may require more in-depth design work upfront, to ensure your orangery fits into your home correctly – in practical terms and aesthetically speaking. The construction process may also be more disruptive, as builders will need more space to store materials. Additionally, the part of your home that is being worked on may also be out of action for a while when the orangery is being built, so it’s worth consulting your builder on the time period so you can prepare and make alternative arrangements if necessary, to minimise any disruption to your day. Quick note: Orangeries, by their very nature, will let in less light than a conservatory. The average cost of an orangery is upwards of £20,000. However, before you cringe at the price, they can also cost as little as £10,000. Even though that may still cost double the amount of the average conservatory, it’s worth noting that your typical orangery provides better functionality and greater home value than a lean-to or Victorian-style conservatory extension. As a rough estimation, you should budget between £2,000 – £2,500 per square metre for your your orangery. For an average orangery, measuring at 4.5m x 3.5m (16m2), the overall cost is somewhere between £30,000 – £35,000. This is the orangery cost for a completed product, including the costs for internal electrics, plastering, lighting and reverting the outside of your home back to its original state. According to Real Homes, a ‘solid’ home extension costs anywhere between £1,500 to £3,000 per square metre, depending on your location in the UK – substantially more than an orangery. 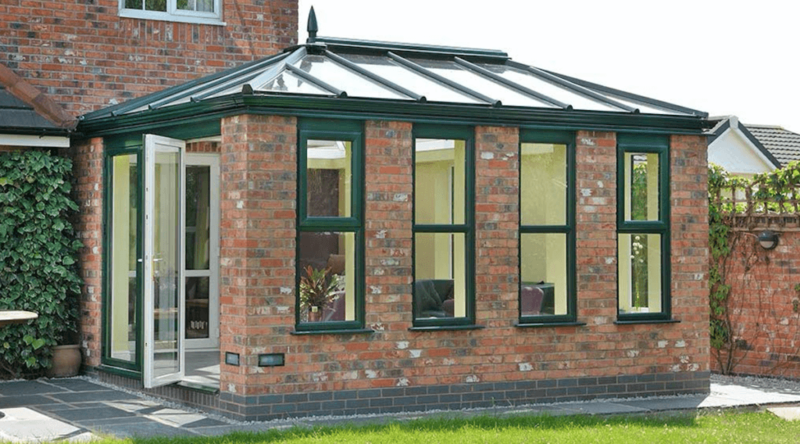 How different materials affect orangery prices? Orangery prices vary as they’re usually built to order, and therefore you will only know the full cost once you have discussed your project with a professional and had a specific quote created for your orangery. What size of orangery should you choose? Before you order choose an orangery, firstly take into account how you will use the space and be careful not to overwhelm the size of your home or garden. By applying the Golden Ratio, you’ll have an orangery that provides you with a comfortable amount of living space whilst adding real value to your home. Used by everyone from artists to architects, the proportions afforded by the Golden Ratio make for specific and aesthetically pleasing dimensions. By applying the belief that aesthetic beauty can be achieved by adhering to a ratio of 1:1.168, you can consider the perfect size for your orangery by measuring up the length of the side of the house it will be built onto. For example, if you have a house with a width of 28ft (roughly the average in the UK), the orangery, according to the Golden Ratio, should have a width of 17.5ft. These dimensions give you an orangery that looks right in comparison with the rest of the house. In terms of depth, you can judge this for yourself, depending on the size of your garden and, again, how you plan to utilise the space. The main differences between an Orangery and a Conservatory are the base and the roof. Orangeries typically have a brick base and a flat perimeter roof with a centralised roof lantern whilst conservatories typically have a centralised pitched roof and a frame construction that goes from the ground directly up to the pitched roof edge with no perimeter. The biggest structural difference is the construction of the roof. A conservatory has over 75% of the roof glazed, an orangery has less than 75%. A conservatory by the very definition must also have over 50% of its wall area glazed. Orangeries & Conservatories have many structural similarities in that they are both built on a solid concrete foundation and usually incorporate some form of brick base. A conservatory frame runs from the footing to the leading edge of the pitched roof and the glass panel sizes for conservatories are usually much larger than orangeries. An Orangery frame typically incorporates either brick or shorter wooden pillars to support the flat roof perimeter. They usually have a perimeter flat roof with a central roof lantern that will feature glass panels, vent windows etc. Conservatories tend to make use of patio/french doors whilst orangeries usually use bifold/folding door systems. Both structures use double/triple glazed window units to maximise energy efficiency, whereas some older atrium-style orangeries sometimes use single glazed units. Are orangeries cheaper than conservatories? Building an orangery is more often cheaper than building a single-storey extension – based on a structure that is like-for-like in size. For example, if you had a desirable budget of £2,000 per sqm, the average orangery costs upwards of £18,000 (subject to design). They can be cheaper than this or more expensive depending on the size, features and specific style you desire. Popular with those who want to benefit from modern open-plan living, orangeries are definitely one of the more affordable ways to create a multi-functional space for all to enjoy. Do orangeries add value to a property? An orangery is definitely a worthwhile investment, particularly if you need the extra space, and it’s much more cost-effective than building a conservatory or moving home. With so many different styles and sizes of orangeries, it’s important to take your time when choosing the right size for your home. Making sure the orangery looks as though it is an extension of your property is crucial as one day a prospective buyer would be more likely to buy, if you should consider selling in the future. Holding family get togethers, dinner parties or children’s parties. Utilise the space as your own home office or study. Put your treadmill in here, stick some headphones on and exercise with lovely views of your garden. Another plus for an orangery is the ability to use different interior doors to access the room it’s attached to. Such designs include French doors, bi-folding doors or double glazed patio doors. Each would enhance not only the orangery, but will definitely be a great talking point when friends or family drop by. Many orangeries offer the ability of energy efficient glazing, frames and modern roofing systems. This will help you to make substantial savings on your energy bills. No matter what time of the year, an orangery is always warm, comfortable and a place where you can relax and enjoy plenty of natural light. Benefit from a room that feels spacious with plenty of room for your favourite armchair, pictures, coffee table or plant. Having an orangery installed saves cash on energy bills and is much less hassle than moving home. There aren’t any deposits to pay, legal costs, mortgage fees, removal firm fees or stamp duty fees. So, adding an orangery which will certainly increase the value of your home. How long does an orangery take to build? The construction time for the average Orangery is usually between 3-5 weeks, depending on the size, complexity and bespoke elements required for the structure. We would recommend allowing for this amount of time before your orangery project is signed off and ready to use. Before you take the leap towards extending your property, you need to be certain on whether or not you need planning permission. UK law states that you must get planning permission to enable you to build on, or change, the use of land or buildings. You may also want to establish whether or not your house is classed as a ‘new build’. Many developers often place limitations on them. In order to make the design process a little easier, we’ve put together 5 questions to ask yourself when designing your orangery to ensure it is the right design for your property. What will I be using my orangery for? Whatever you use your orangery for, it will have an effect on how the structure is designed. Will you be using the space as an extension of your kitchen? Perhaps as a spare bedroom? You wouldn’t necessarily want to extend your current kitchen, but may desire another bedroom at the back of the house for when visitors stay. What are the dimensions of my new orangery? You will need precise measurements to be carried out on your property in terms of the dimensions of your new orangery, before any work starts. More often than not, people get the dimensions wrong which leads to layout issues, along with incorrect accessibility and aesthetics of the property. What orangery design would I like? There are many orangery designs to choose from. You may decide on a period orangery, or perhaps an ultra-modern ‘lean-to’ structure. Whatever you decide on, be sure that the interior and external features go well with the orangery design. Ornamental features, for example, won’t always work well with a small and contemporary orangery. Where will my orangery be located? The location of your new orangery not only has an effect on the atmosphere in the room, but it may also affect how much natural light you receive, as well as the size of the extension. How will my new orangery fit in with the style of my existing property? Lastly, it’s important to ensure that your new orangery fits in with the current style of your property. The goal is to have an extension that attracts attention for its high-quality, luxury appeal, rather than being completely separate in look to the rest of your home. Orangeries can be framed using a variety of materials, primarily timber and aluminium. There has also been a recent desire for the use of oak-framed structures, which combines rustic charm of traditionally jointed and pegged timber frames with large areas of glass for natural sunlight. A commonly used material for orangeries, uPVC is more affordable than other alternatives, largely available and maintenance free. However, there are better options available to complement a period home, as the material tend to result in bulkier, inauthentic sections/details. Traditional glass houses always used metal frames, and aluminium is still a popular choice when seeking that classic look with additional slim sightlines. It can also be used to create more ornate designs, similar to the orangeries built during the Georgian and Victorian eras. Modern aluminium frames include thermal breaks to obtain more heat, and can be powder-coated in any colour you choose to produce a nice maintenance-free addition. Timber frame is another popular option for a period home. Oak-framed orangeries look wonderful and if unpainted, the wood will weather beautifully. Other popular timbers include sapele, Douglas fir and accoya, which is often modified to be greatly durable and resistant to fungus. Ensure that wood is factory painted or treated, which will also make it rot resistant and result in lasting around 10 years before requiring maintenance. For the best of both worlds, a select amount of manufacturers offer composite orangery frames, which have an aluminium exterior, which is great for low maintenance, and a timber interior, for added warmth. Background ventilation helps protect the fabric of a building from harmful the harmful effects of condensation, mould etc. Consequently, where existing windows once provided background ventilation, any replacement windows should also provide background ventilation. However, alternative ventilation can be provided so that window designs can be amended without “breaking rules”, such as mechanical ventilation or high level air bricks added at least 1.7 metres above the finished floor level, to help in avoiding discomfort from draughts. Purge ventilation is designed to improve thermal comfort and reduce overheating during the summer months, as well as being required to remove large amounts of water vapour and pollutants. For hinged or pivot windows (that open 30 degrees or more), or for sliding sash windows, the area of the opening should be a minimum of 1/20th of the floor area of the room. For hinged or pivot windows, that open less than 30 degrees, the area of the opening should be at a minimum of 1/10th of the floor area of the room. The orangery roof is the latest style-trend to have been made popular by homeowners, and can be achieved in various styles. It can be as simple as a standard conservatory, with the addition of a full pelmet surround or a full brick-built style with a lantern roof supported on its centre. These styles are generally incorporated during installation, but the like of the EUROCELL LUSSO pelmet are transforming orangery roof designs. Such a pelmet offers an orangery-style internal pelmet that can be installed as part of a new conservatory or retrofitted to an existing one, giving a whole new concept in design to the structure. The pelmet is often fitted with mood lighting, either up or down, which gives the space a warm and pleasant atmosphere whilst forming an attractive addition to your orangery. Self-cleaning glass was once described as impossible, but thanks to a research and development programme created many years ago by Pilkington, the world’s leading glass manufacturer, self-cleaning glass is now very much a reality. Although not a miracle cure, it can even over time (with a little rainfall of course) make bird droppings disappear. The secret of their “Activ Self Cleaning Glass” contains a special coating that reacts with ultra-violet (UV) rays from natural daylight (which works even on overcast days and at night) to disintegrate organic dirt. Organic dirt generally comes from livings plants and creatures (i.e. fingerprints, tree spa or bird droppings) whilst regular dirt comes from non-living sources (i.e. plaster dust or cement). The special coating requires around a week’s exposure to daylight to fully activate. Self-cleaning glass really is no fable, as its special coating breaks down organic dirt, whilst reducing the adherence of regular dirt. Self-cleaning glass is a well-worthy investment in the long-term, as it will save you both time and money, and from a cleaning standpoint, it is far safer than regular glass windows or roofs, particularly for orangeries. One of the biggest decisions you’ll have to make is whether to get your orangery built from a large national brand or a local firm or builder. Our research helps you make the decision based on conservatory owners’ experiences. Some prefer to go with bigger brands because of their experience and reliability, whereas others prefer to choose a local firms for a more individual service. If you go local, you’ll also have to choose whether to pick an independent firm or a local builder, who is likely to have a greater skill set, than simply having the ability to build an orangery. This may be good if your project is complex in design or larger than the standard orangery size. According to a recent survey, the majority of people (70%) bought their conservatory/orangery locally, with most choosing a local specialist/company rather than a builder. But ultimately, the choice is yours. Take your time, weigh up the options you have and make an informed decision based on all of the factors discussed in this guide.